Property Size 144 sq. ft. This charming cottage is your perfect Key West getaway. When you enter through the gate, you are greeted by the big shared pool and tropical foliage. The cozy cottage offers a kitchenette with Keurig coffee maker and full bath downstairs. The loft master bedroom up a wooden ladder houses a plush queen bed. There is room for one more person in the trundle bed downstairs. Outside, there is a gas grill and plenty of chairs or chaise lounges to catch some rays. 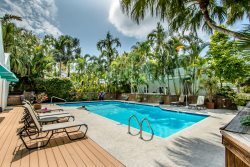 The pool is not heated but gets sun all day long, so it is the perfect temperature to cool off after a fun day on Duval Street. Or soak in the hot tub after a long day of walking around town. Fausto's Food Palace, a local grocery shop, is directly across the street, and offers everything from breakfast sandwiches to wine and beer. There are two bikes for guests to use during their stay at Island Pearl free of charge. Dogs must be preapproved by management. Must wear a bathing suit in both the pool and hot tub. The maximum people allowed in this property is 3. If there are more than 3 people in your party, your party will be asked to leave without compensation. Pets: Pets considered; ask manager. Location: One block to Duval Street.